Short before finishing this post I heard about the terrible bomb attack at the Erawan Shrine in Bangkok and the news break my heart. 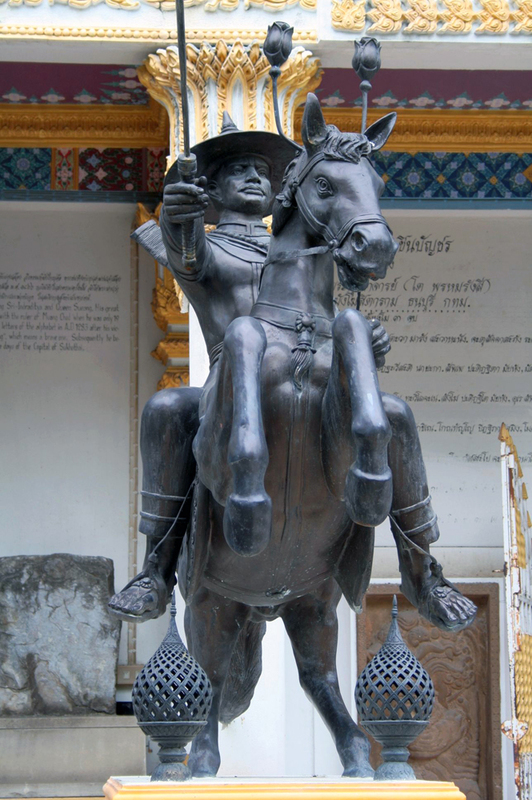 I have been to Bangkok more than ten times and I also visited the Erawan Shrine in 2012. My thoughts are with everyone effected and with Thailand’s people. 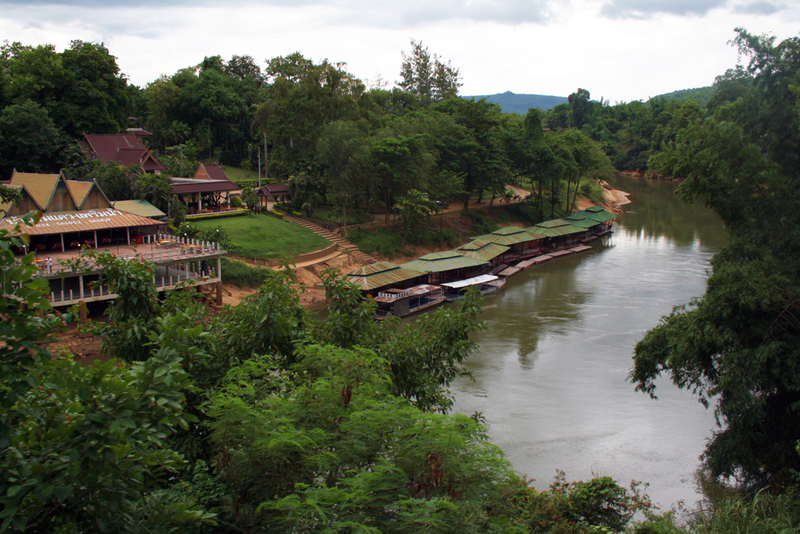 When thinking of Kanchanaburi most people immediately think of the Bridge over the River Kwai, but the region has more to offer and is truly worth a visit. 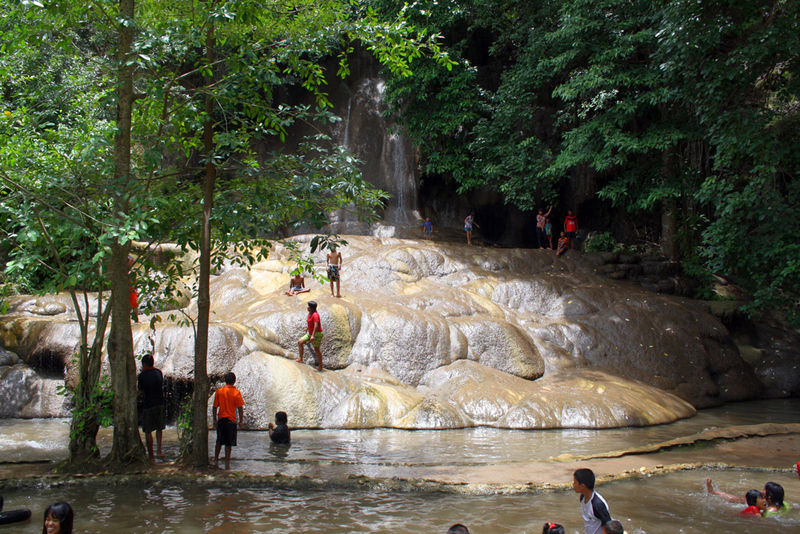 It is nestled in an idyllic landscape and provides dense, lush and tropical jungle, waterfalls and rugged limestone karsts. 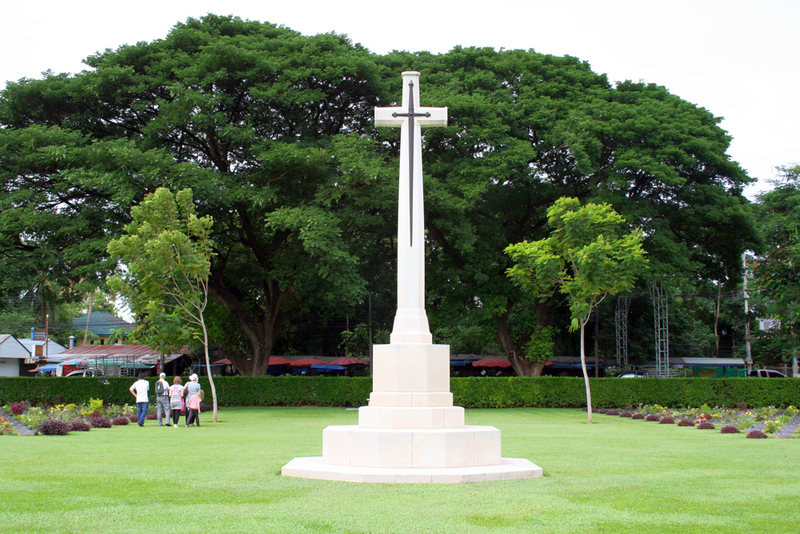 But also its dark history is not forgotten and informations about it can be found on the two war cemeteries, in the JEATH War Museum and in the Thailand Burma Railway Centre.Originally I had inteded a one or two days visit to Kanchanaburi right after discovering the Temples of Ayutthaya. But afterwards I was quite tired and I had a trip through Northern Thailand, Laos and Northern Vietnam ahead of me, so I postponed that trip by one year. 16 months later I returned to Bangkok and I already had a fun flight from Frankfurt where I sat next to a Portuguese couple, Marta and Ricardo. We had a lot to talk about and also made our way into town together. 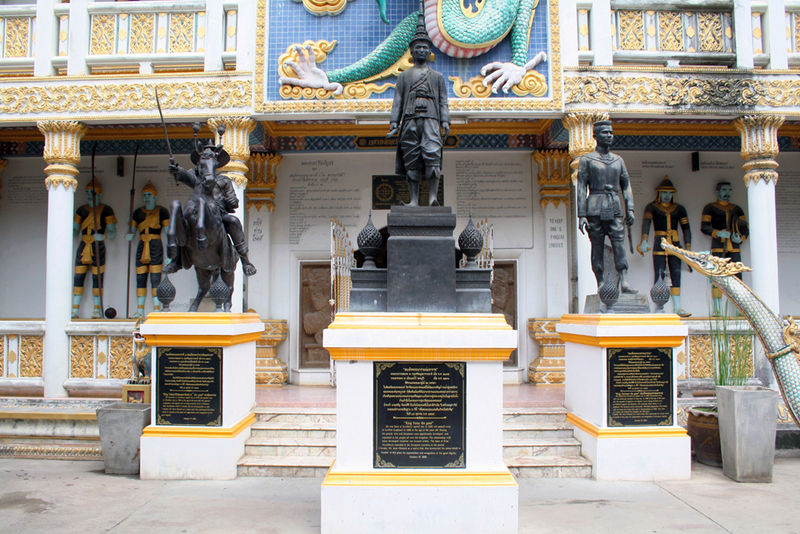 I spent the next two days strolling around the Chatuchak weekend market and through Bangkok’s Chinatown, indulging the delicious Thai food and doing a bit of research for the best option to go to Kanchanaburi. 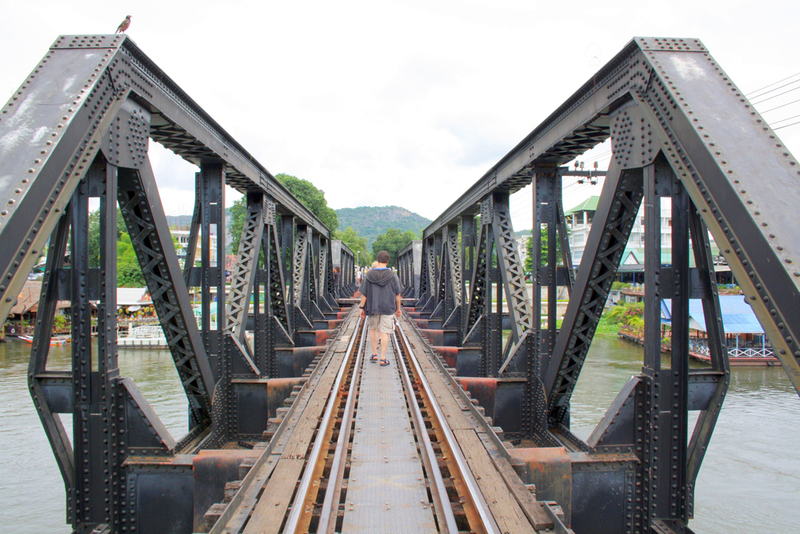 Different than for my trip to Ayutthaya the year before, I decided to visit Kanchanaburi and the River Kwai on an organized daytrip which I booked in one of the many travel agencies in Khaosan Road. 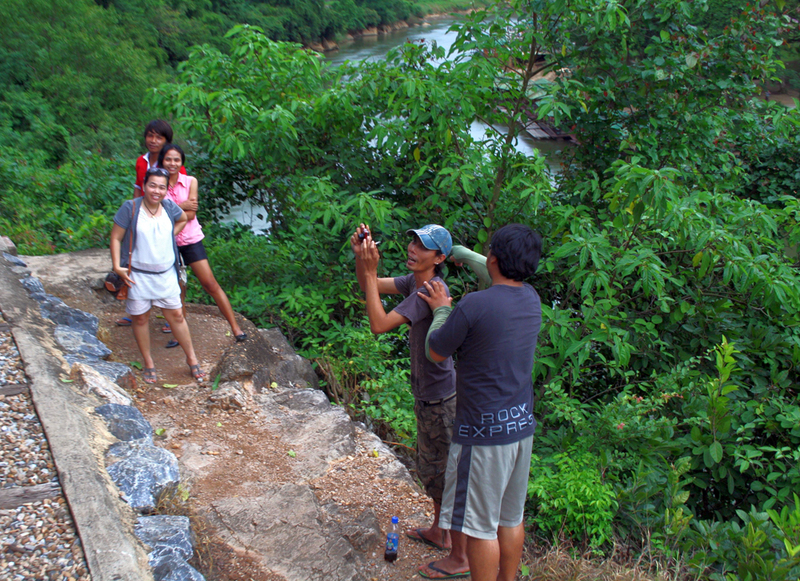 We were picked up from there early in the morning and were taken to the province of Kanchanaburi with minivans. I was the only one travelling solo, everyone else came as family, couple or with a group of friends, but that didn’t bother me. 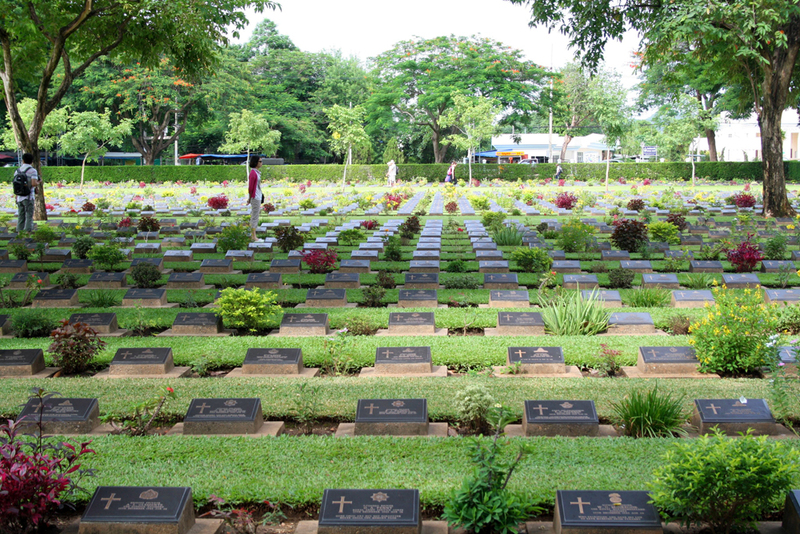 At first we visited the Kanchanaburi War Cemetery, also called Don Rak War Cemetery, where 6.982 prisoners of war (POWs) are buried. 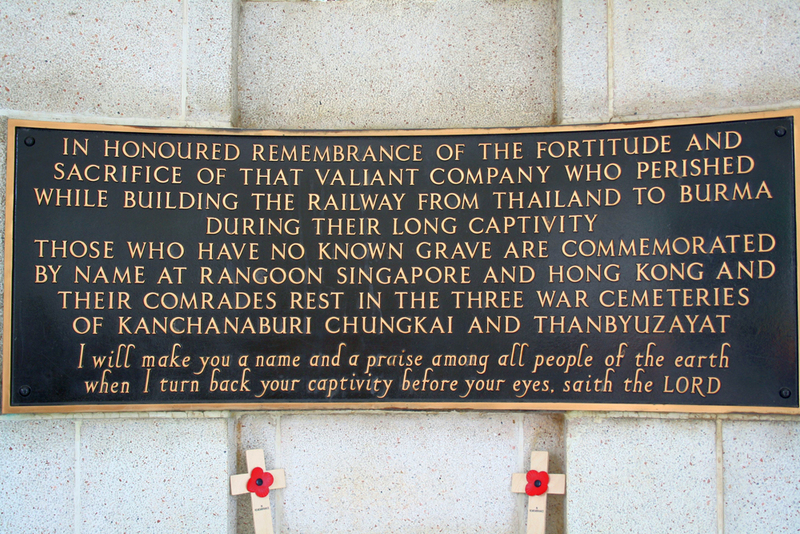 Most of them were Australians, British and Dutch, all victims of the Japanese imprisonment. 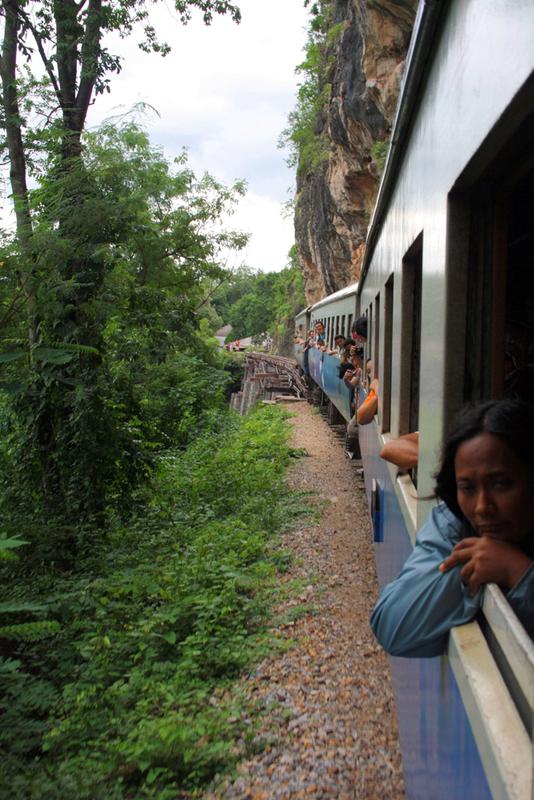 Between June 1942 and October 1943 more than 200.000 Asian forced laborers and 62.000 western POWs were compelled to build the Thai-Burma Railway, also known as Death Railway, which was 415 kilometres long and was located inmidst the jungle. 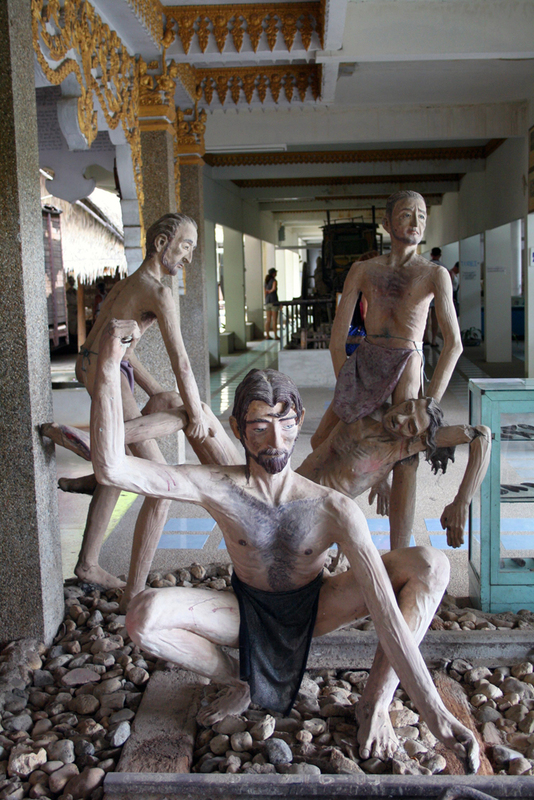 Altogether 80.000 Asian forced laborers and 12.000 western POWs died due to hunger and malnutrition, diseases and accidents. Fortunately we had some time to wander around the cemetery by ourselves. It was very well kept and also very peaceful and quiet although there were other groups besides us. 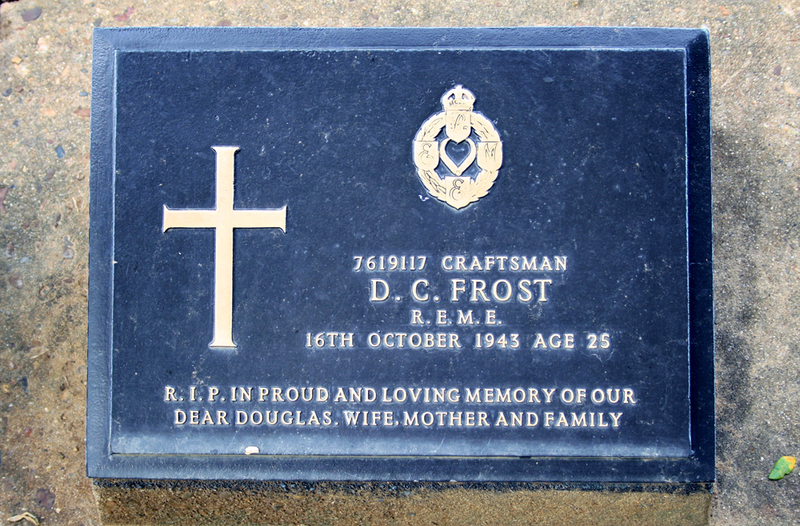 From the gravestones I could see that most of the victims died in their twenties or thirties, so at a very young age. 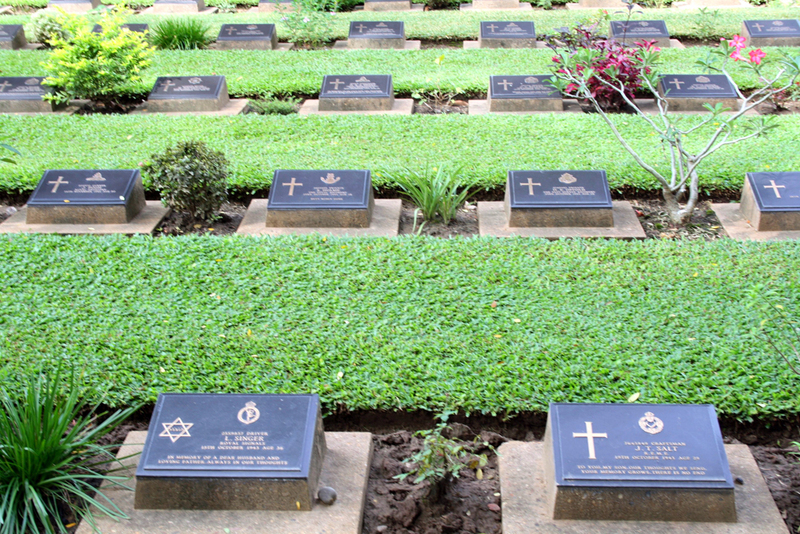 A memorial honours eleven victims from India who are buried in Muslim cemetries. There is a chinese cemetery right next to the Kanchanaburi War Cemetery and another military cemetery two kilometres south of Kanchanaburi, but we only visited this one. 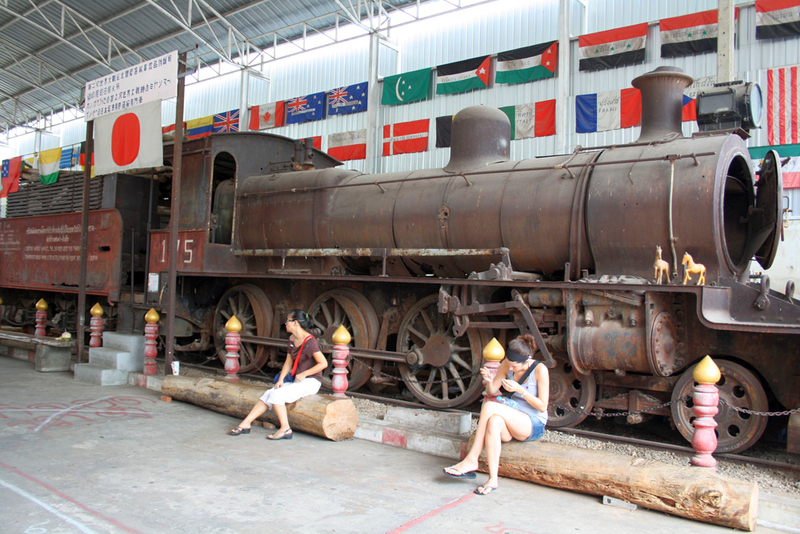 Our next stop was at the JEATH War Museum which is located on the grounds of Wat Chai Chumphon at the Mae Klong river. JEATH stands for the countries Japan, England, Australia, America, Thailand and Holland which were involved in the war. 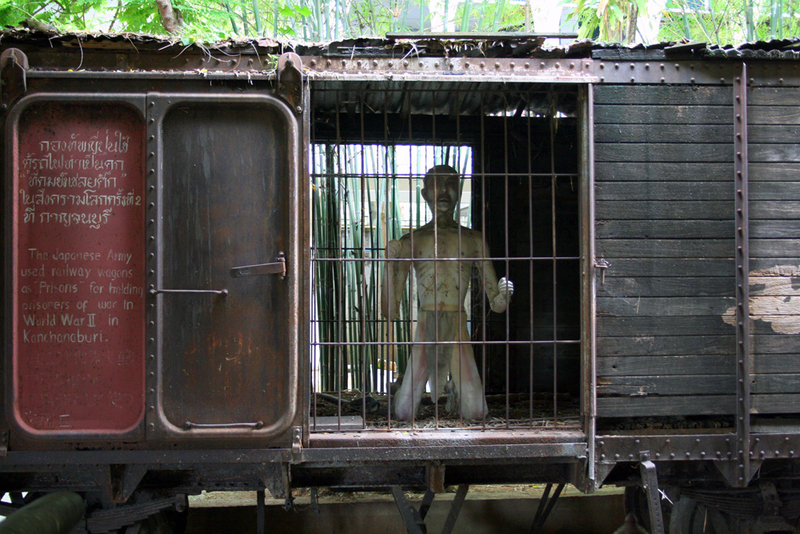 It documents the life of the POWs and forced laborers which were involved in the construction of the Death Railway. 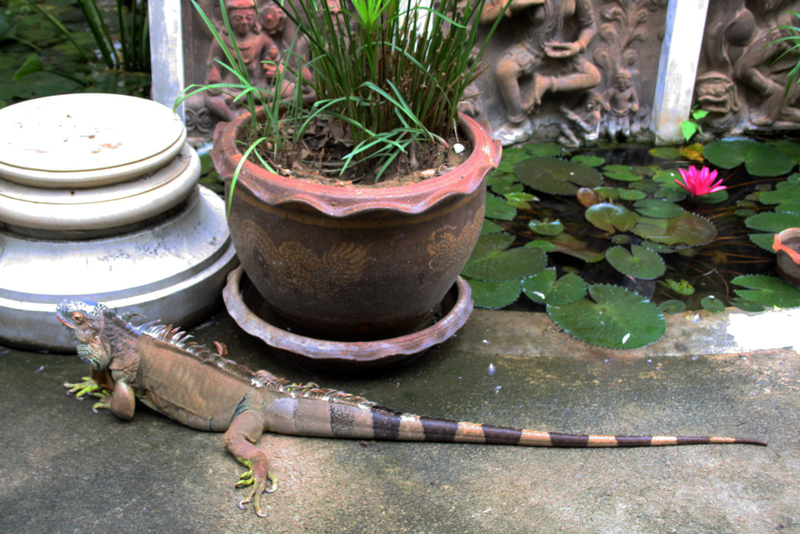 We could also capture a few impressions from Wat Chai Chumphon. 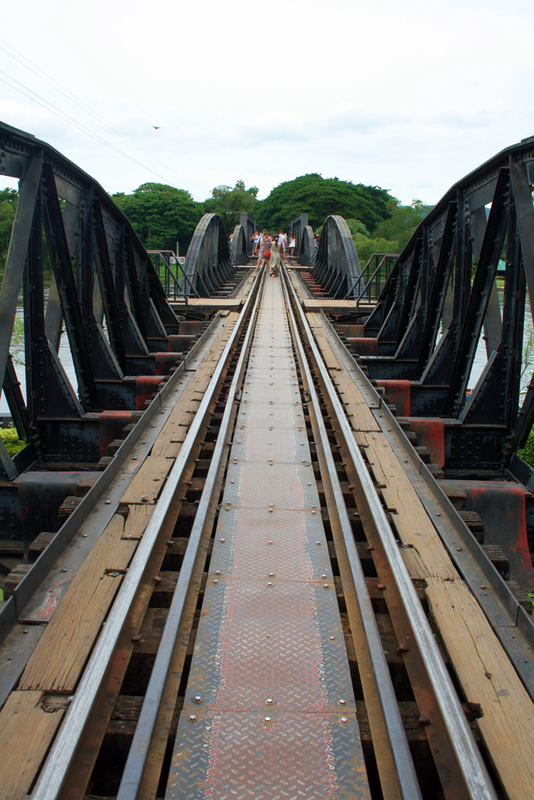 From there we had a first view on the Bridge over the River Kwai. 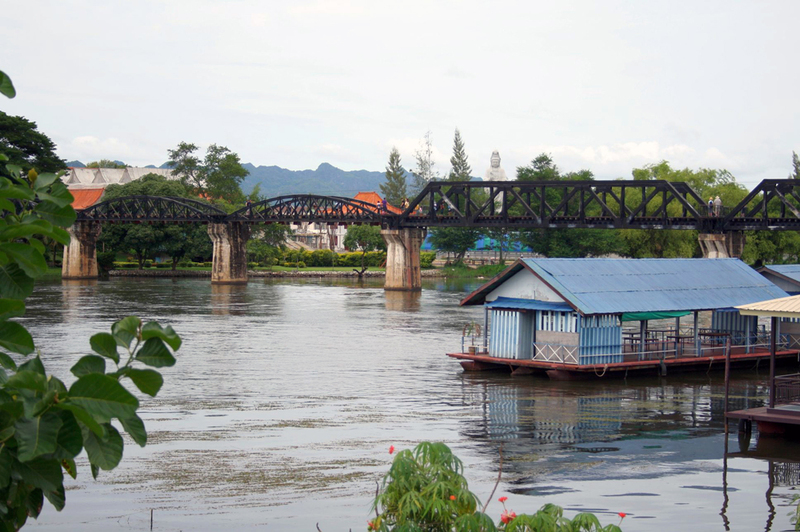 Then we headed to the Bridge over the River Kwai which became famous through the novel of the same name written by Pierre Boulle and the movie by David Lean. Originally there were two bridges which were destroyed through the allies. The present bridge was rebuild by a japanese company and is still crossed by trains which warn pedestrians on the bridge by loud whistling. 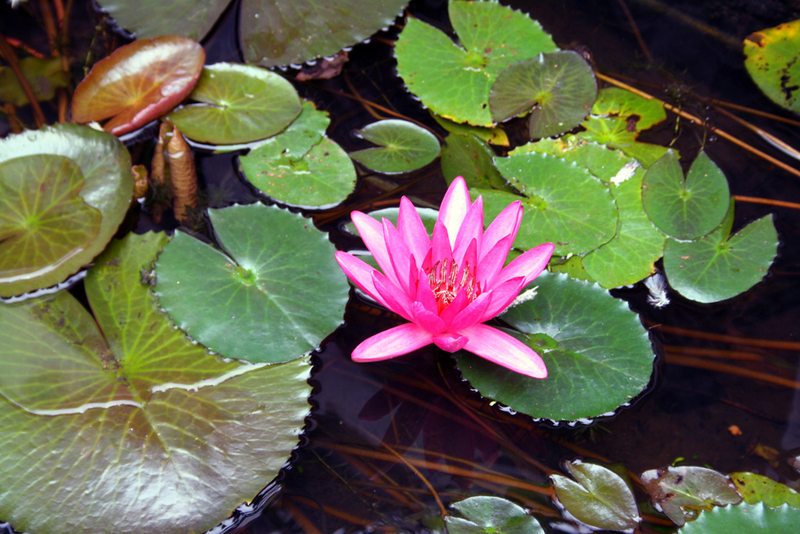 Already in the morning we were told that we have to make a decision whether we wanted to visit the Tiger Temple or the Sai Yok Noi Waterfall plus taking a train ride to Nam Tok. I would really like to see tigers outside of a zoo one day, but I didn’t feel comfortable visiting the Tiger Temple because of its negative reputation (maybe I get the chance to see tigers in the wild in a national park in India one day). 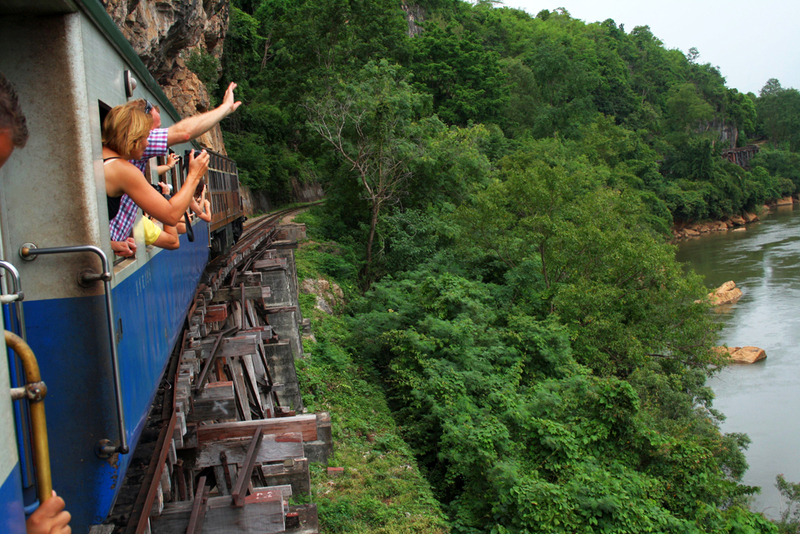 That’s why I had already chosen the Sai Yok Noi Waterfall and the train ride even before booking this daytrip. 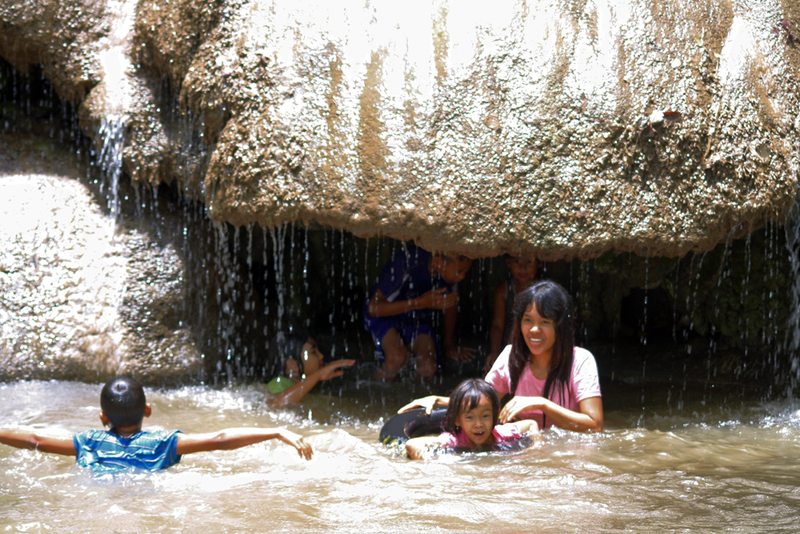 When we got to the Sai Yok Noi Waterfall we saw many locals bathing and splashing in the natural pools of the waterfall, but the people of my group just stayed outside and watched the spectacle while sitting on nearby benches. It was a hot sultry day and I had taken the right clothes with me to go swimming. When I asked the people in my group if they could watch my stuff they were starring at me and probably asking themselves if I had gone mad to take a bath in a natural pool at a waterfall where you couldn’t see the ground. But that didn’t keep me away. This was just the beginning of my adventure (two days later I flew to Kunming to start my journey across Yunnan and Tibet) and I didn’t travel thousands of kilometres to let other people keep me away from what I wanted to do. So I joined the locals for a swim and it was so refreshing and so much worth it! Then we were taken to the station where we boarded the train. The ride was very scenic and took us along the river with its raft houses, through valleys and also passed by the Hellfire Pass and groups of locals who were waving and taking photos of us. Of course, we waved back and took photos of them as well. Afterwards we were taken back to Bangkok where we arrived in the early evening. The trip was a bit touristy and you can for sure organize all this by yourself but of course this takes quite a lot more time and effort which I didn’t have at time. I had also thought about doing a two days trip including a visit to the Erawan National Park, but since I flew to Kunming for my journey across Yunnan and Tibet only two days later, I opted for a daytrip. Although I have been back to Thailand four times since then, I haven’t been to the Erawan National Park yet, but it is definitely on my list for one of my future visits in Thailand. Oh sweetie, I’ve been visiting your blog for a while and I was looking forward to see a new post. I’m glad you’re back with some new fresh and interesting content. I’m so jealous of your wonderful trip. It seems like locals here are always smiling! Beside, there is so much green!!! Thanks so much for the kind words, Agness. 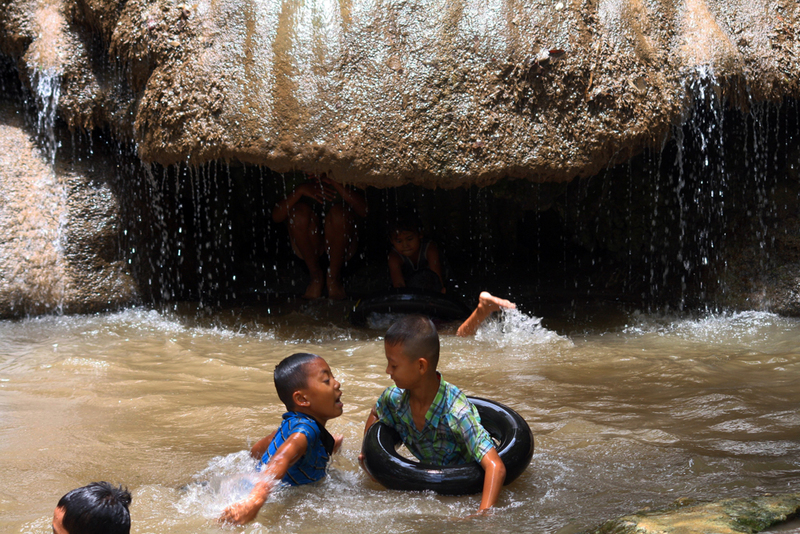 Yeah, the locals were absolutely lovely and I always love to mingle with them, no matter if it’s at a waterfall in Thailand, as a “photo model” in the Summer Palace in Beijing or in the Taklamakan desert in northwestern China. 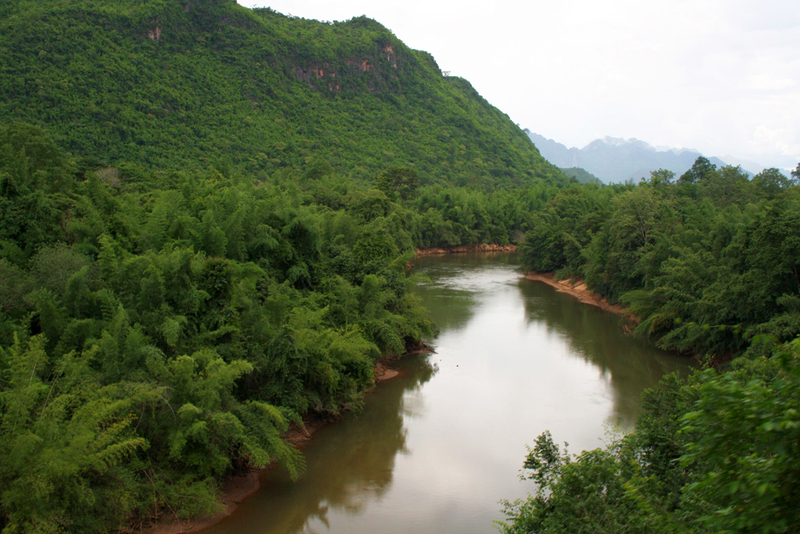 The trip to Kanchanaburi was amazing and the region indeed provides a lot of lush green tropical jungle. Plus it’s very easily accessible from Bangkok. You should definitely go there. It is easily accessible from Bangkok and you could stay in one of the floating rafthouses, something which I missed but what I would loved to do another time. 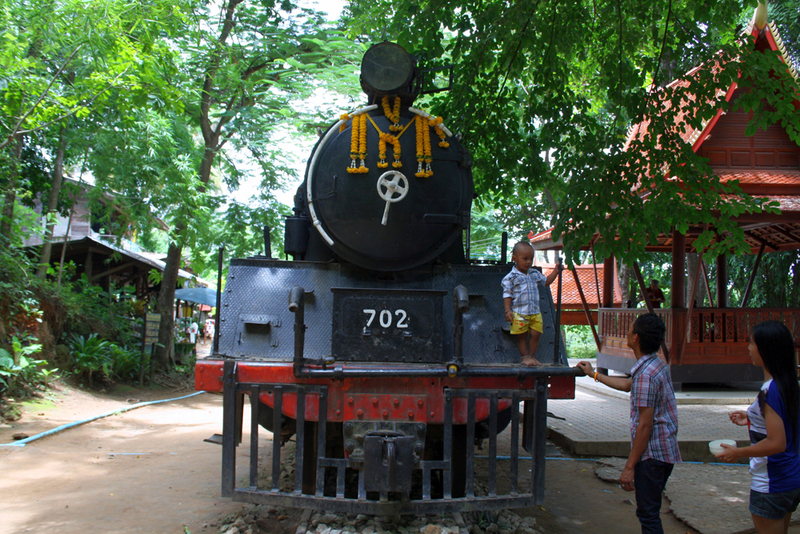 Also, there are lots of day-, two- and multi-daytrips from Bangkok to Kanchanaburi province. Thank you so much for the kind words and for stopping by. 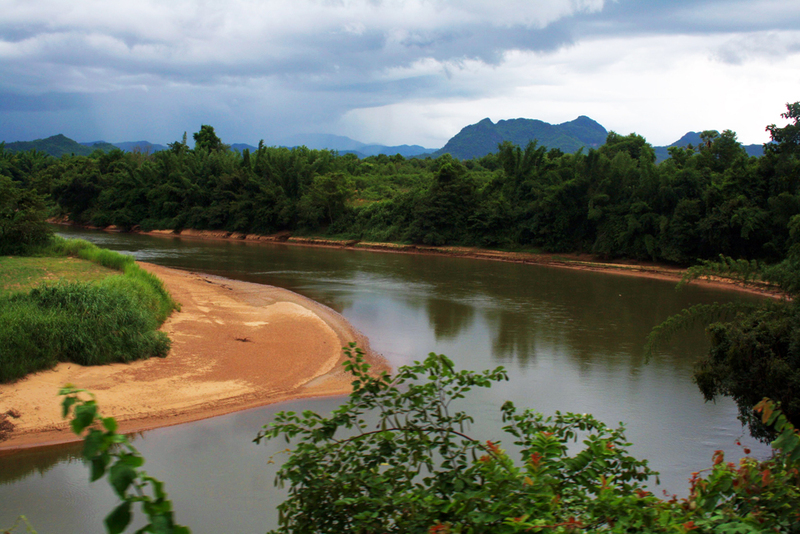 I am sure you will love Thailand, Julie, and if you are interested in WWII history or if you are nature lover you will highly enjoy Kanchanaburi province. Mingling with the locals was fantastic, it is always my favourite part of travelling. 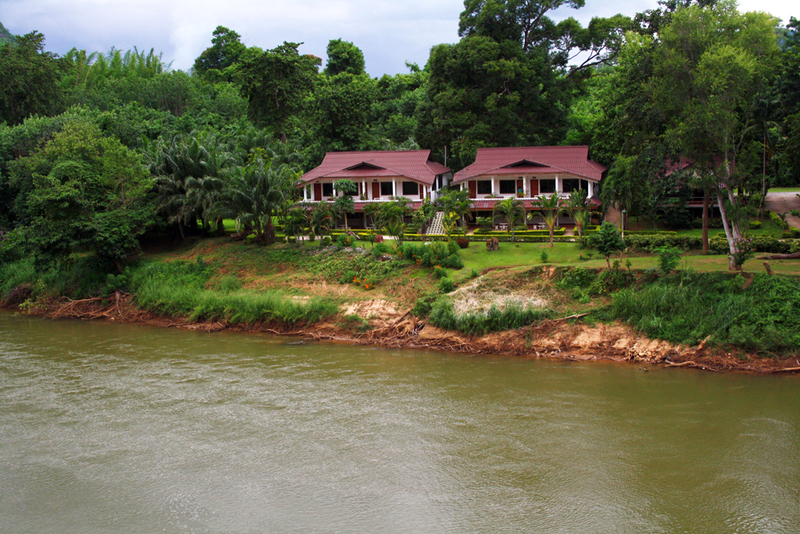 Getting to Kanchanaburi is also easy, it’s not far from Bangkok and there public busses, minibusses and organized day trips from Bangkok but sleeping in one of the Floating Raft houses at the river must also be amazing. That’s what I plan for another visit.